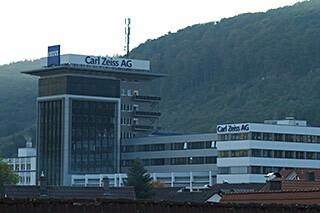 The following is based on my own testing using both Zeiss MTF testing equipment, and subjective areal image projection. The commentary should in all cases be considered my opinion. Contrast is always very high, due to very efficient antireflective coatings and anti-reflex black paints and light traps. Even at T1.3 MTF at 10 lp/mm in the center of the image is just under 100%. Wide open, MTF at 20 and 40 lp/mm will be quite good in the center of the image, with the 20 and 40 lp/mm values relatively close to the 10 lp/mm value, as compared with other lenses of similar aperture. Optimum MTF on-axis (in the center of the image) can be reached at surprisingly large apertures due to the very effective correction of aberrations. With some focal lengths it can be reached at apertures just below T2, with some other focal lengths, more stop is required, but generally not more that T4 and never more than T5.6 (usually with the longer focal lengths). It should be noted that the preceding is based on MTF measurement, and in the case of a lens reaching maximum MTF at T5.6 for example, the MTF at T4 might only be 2-3% lower, which is not easily discernible by eye. As a general rule, a well-adjusted Master Prime should look good wide open and start to look very good around T1.7. By subjective observation best performance will usually be seen between T2.8 and T4.0. Shooting at the optimum T-stop should only be necessary when capturing images for very high resolution sensors and for projection at very large screen sizes. Distortion is very well corrected on all focal lengths. The correction is particularly impressive with the very wide Master Primes (12, 14mm) which use radically aspherical front elements (see photo). There should be no image shift during focus. 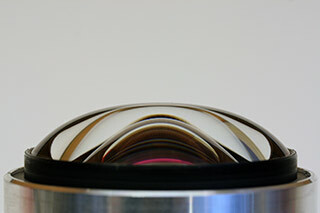 If this is seen, it means something is loose or broken in the internal mechanics of the lens. Regrettably any visible image shift means the lens will need a full overhaul. Flatness of field is generally very good. In some cases, due to a complex correction, a “wave” field curvature can be seen rather than the typical center to edge field curvature. This will usually be seen with lenses in the 16 – 21mm focal length. This may be a result of an incorrect field curvature adjustment. Field curvature is adjustable on all Master Primes, but it is a very difficult adjustment to do correctly. Image symmetry should be very good. However this is one area where problems can occur with lenses that are frequently rented and especially ones that are shipped a lot. The Master Prime optical design depends on the mechanical system working perfectly. All the internal optics are adjustable. Some of these adjustments are very “touchy” and the shock of impacts in shipping can de-center the optics. This results in a “tilted” field curvature and manifests as the asymmetrical focus at the sides and corners of the image that can be easily seen on a lens test projector. The solution for the above mentioned problem is an optical adjustment. In some cases, the adjustment can be made with only minimal disassembly. Unfortunately this is not often the case. In most cases a full overhaul will be required to correct optical problems. Not any lens technician can do the needed adjustment. Without both special training and a large investment in special tools, it will be a frustrating and ultimately pointless exercise. I know of which I speak. A lot of the silver hairs on my head were acquired during the process of learning how to service these lenses which took years. Suffice it to say that every focal length in the Master Prime set has a “personality”. No one buys or rents these lenses looking for average performance. They are looking for the state of the art. And a properly adjusted Master Prime is something special. In my opinion, the only other lenses that can compete with Master Primes in optical quality are the CW Sonderoptik Summilux-C (Leica) primes. The only Zoom lenses that can compete (and suprisingly well at that) are the Fujinon Premier Series zooms. 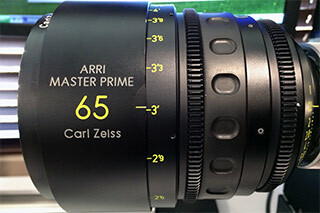 Zeiss Master Primes are an ARRI/Zeiss product and are available worldwide exclusively through authorized ARRI dealers. 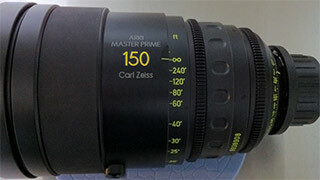 Zeiss Master Primes are a high-end cine prime lens set and are manufactured in limited numbers. If you are interested in purchasing a new set of Master Primes it is important to get in touch with an authorized ARRI dealer to inquire about lead times. You won’t find sets of these lenses sitting on shelves waiting to be sold. Availability of used Master Primes is extremely limited. Used lenses only rarely come up for sale and are usually sold very quickly. If you are considering the purchase of used Master Primes it is very important to have the lenses checked out by a qualified lens technician with specific experience of servicing Master Primes prior to making your purchase. It is very easy for technicians without Master Prime service experience to come up with very inaccurate estimates of service costs. Such an error could result in costs running into the several thousands of dollars. Master Macro 100mm T2.0 T*XP Note: The Master Macro is very different mechanically from the T1.3 Master Primes, and is the only lens in the series that is a T2.0, but it is still considered part of the “Master Family”.